Am I the only one who has circled September 25 on the calendar? That would be the day that ABC's new show Pan Am begins. I know I'm not alone in my excitement about a Hollywood recreation of this golden age of aviation. 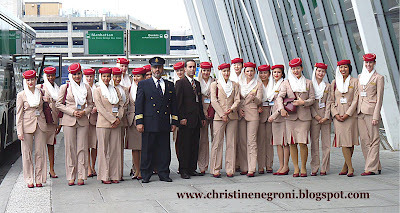 Just the other day while trying to get a photo of the famous Emirates flight attendants for a story I am writing for The New York Times, I asked them, not a one of whom was American, "Do you know that scene from Catch Me If You Can?" and without having to explain that I was talking about the 2002 movie in which Leonardo DiCaprio strides through JFK in the company of a bevy of beautiful stewardesses, they all nodded "of course". I have to wonder, is that the scene that launched a television pilot? Because watching the trailer, there's plenty of the breath-taking, en masse strolling that delivered the punch in the movie, and clearly is part of the punch ABC is planning to deliver with this retro-fantasy about air travel. But wait, maybe its not a fantasy. Even though flying on most airlines may lead travelers to believe beautiful, personable, customer-focused flight attendants do not exist, I'm here to tell you there is a small coterie, an exclusive little club of airlines whose executives believe this class of employee is first class, no matter where on the airplane he or she is stationed. In addition to Emirates, "Etihad and Qatar Airways" are two other Middle Eastern carriers who get it, suggested Shashank Nigam, the man behind the airline marketing firm, SimpliFlying. Then he added, Singapore, Korean Air, Southwest and Virgin Atlantic. Well of course, good looks as a criteria for hiring someone is the kind of retro a lot of feminists, myself included, have long opposed. But what these airlines are doing isn't really about having the most physically attractive flight attendants. Catherine Baird, director of training for Emirates told me, "Heck, we can make anybody look beautiful." What she is looking for is that under-the-surface quality that makes a person shine. During my week attending classes at Emirate's crew training center in Dubai the overwhelming focus was on teaching students how to forge relationships with customers. An entire day was spent in a revival-like, team-building program in which students are asked to think about the airline's values and figure out ways they will apply those values on the airplane. This is both touchy-feelie-stars-in-the-sky stuff and a ground level exercise in how to put ones' self in the shoes of the traveler. Nicole Domett of Aviation and Travel Training Group in Auckland, New Zealand told me it was absolutely critical that airline management recognize and communicate the importance of the role of flight attendants not just for safety but for the whole maggilah. In a long-ranging conversation about service standards in the industry, she was unequivocal. The CEO has to "share the vision" with the flight attendants and with their trainers she said. 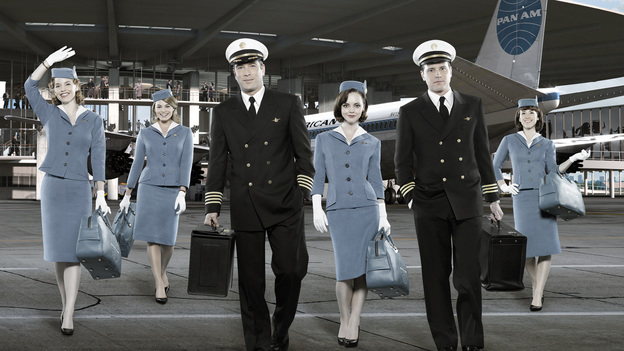 Pan Am the television show may be Mad Men with wings, a glossy vehicle about high altitude hijinks. But how great would it be if the show convinced airline bosses around the world that flight attendants can be powerful ambassadors for their brands. They might even start to empower flight attendants to be the stars the airlines and the passengers want them to be. I can not agree with you more. In-flight service is an extremely important component of the airline brand. However, the integrated concept of airline branding has a long way to go before being the norm. Unfortunately, some airline executives still look at the airline industry as a cash cow. On the other hand, considerable number of today’s passengers has humble idea of what a good in-flight service is supposed to be. Putting extreme cases aside, those passengers - mostly from the third world countries - will be satisfied with the service they receive most of the time. I am all for turning the clock back to the 1960s as well. 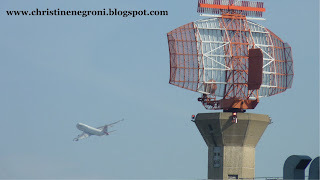 The airline industry would not be the only part of our culture that would benefit from a return to a bygone era. 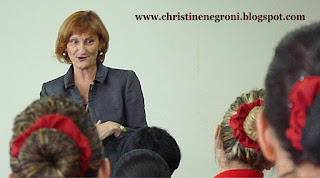 Christine, I am surprised that you, however, would suggest that more airline companies around the world look to the Middle East and South Asia as role models for women in the workplace. In the airport hotel on my layovers in Tokyo, I have the opportunity to see flight crews from all over the world. I have never seen even one Korean Air Lines flight attendant who had a waist over 22 inches or was even 3 pounds overweight. There's no way they can hide it. Their uniform skirts and slacks would reveal a dime in their back pocket. I guess thin women are just genetically predisposed to better customer service. Perhaps physically attractive women have an easier time assimilating "company values". Maybe it makes them better able to understand the personal benefits of their company's economic success. By the way, are the Qatar and Etihad flight attendants in the same union? Are their collective bargaining agreements similar. Do they lose senority for pregnancy leave? To quote one of my all time favorite airline commercials from the 60's, "Is that any way to run an airline? You bet it is!" I can't speak for Korean Air Lines, but Emirates flight attendants come in all reasonable shapes and sizes. Like pilots, flight attendants must be in good physical shape to be able to spring into action in the event of an emergency. But 22 inch waistlines and no more than 3 pounds overweight? Nope, I didn't see that during my days of crew training at Emirates or at Etihad. As Catherine Baird of Emirates told me, "Heck, we can make anybody look beautiful." What she is looking for is that under-the-surface quality that makes a person shine. And as a passenger, I am too. I am very excited about the upcoming Pan Am TV series. I am part of a Pan Am family and was fortunate enough to work for Pan Am in the early 70’s as an engineering intern. My grandfather was an engine mechanic for Pan Am in Miami. My mom worked in the flight operations office in LaGuardia office (yes LaGuardia) where she met my father. My late father hired in Pan Am as a mechanic and, much to his delight, was quickly assigned as a Flight Engineer on the famous and fabulous Boeing 314 flying boats. He logged about 2400 hours on the 314s including 61 Atlantic crossings. I grew up hearing wonderful stories of those flying boat days; the exotic port of call, landing on the Nile, constant engine problems enroute, epic soft ball games between rival Capt’s teams in Natal, severe icing conditions into Foynes (Ireland), an episode of a fellow flight engineer saving a mechanic from drowning in Fish Lake, Liberia. His most fascinating story was being on Capt. Masland’s round-the-world trip during World War II. It was Pan Am’s first commercial and second ever round-the-world trip. Dad didn’t quite make the whole way. He caught malaria in Liberia and had to be dropped off in Honolulu to recover before catching up with the airplane after it completed the trip. Somewhat ironically, many years later I was a member of Boeing’s accident investigation team on Pan Am flight 103, the airplane blown up over Scotland on December 21, 1988. That was tragic day for many, a sad reunion day for me, and a sadder day for an iconic airline. Thanks so much for sharing your memories with us. It makes for fascinating reading and no doubt, a fascinating life! We are so excited about the new Pan Am show. Aviation becoming more popular is one of our goals at Aviloop so we are thrilled to see all the interest. Aaah, the wonders of flight.. I believe Emirates allows women to wear pants if they have objections to showing their legs. The recruiters visit major cities around the world. Check their website for the calendar, show up at a recruiting session and ask. Good luck.